Broggy Shop, seen left of Broque's Shop. 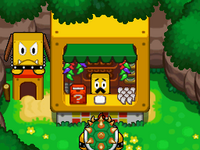 Broggy's Shop is a shop mained by Broggy during Mario & Luigi: Bowser's Inside Story. It is a shop, shadowed by Broque Monsieur's Shop, that sells Gear. Broggy only sells gear to Bowser, as Mario and Luigi offend his master Broque Monsieur. After a purchase is made, Broggy will give Bowser the opportunity to use a Scratch Card, which will give money back to the player depending on what they scratch off. As Bowser grows more powerful and buys more from him and his master, Broggy will up his Horn ranking. As a result, the scratch card has less boxes, which means there is a higher chance of landing on any of the prizes. Before the events of the game, Broggy was the main mascot of the shops. However, that was before Blitties came and his owner wanted them to be the mascot. When Bowser gives Broque Monsieur all fifteen Blitties, Broggy will go with Bowser for a walk, and enable Bowser to use Broggy Bonker. His store is preserved by Broque, which he runs both while Broggy is gone. Broggy's shop is also mained by Broque whenever Bowser uses a Shop Block, even when all fifteen Blitties haven't been found. This page was last edited on November 20, 2017, at 18:11.